Since its founding in 1885, the School of Pharmacy at the University of Kansas has established itself as a leader in pharmaceutical education and, since 1996, offers the only Doctor of Pharmacy degree qualifying as an entry-level practice degree. The six-year program requires completion of 208 credit hours and includes two years and 68 credit hours of pre-pharmacy courses that students may complete at any approved and accredited academic institution. Nine pharmacy practice experiential rotations comprise the sixth and final year of the program, each rotation having a one-month duration and requiring 160 contact hours in various pharmacy practice settings located (primarily) throughout the state of Kansas. Additionally, the program introduced early experiential rotation requirements for first, second and third year professional students into the curriculum in fall semester 2007. The School of Pharmacy is composed of four academic units: the Department of Pharmacology and Toxicology, the Department of Pharmaceutical Chemistry, the Department of Medicinal Chemistry and the Department of Pharmacy Practice. Throughout the history of the program and moving forward, the curriculum has been continually revised to provide the education and experiential training essential to acquiring and nurturing the knowledge, skills and abilities required of pharmacy practitioners moving into the future. The University of Kansas School of Pharmacy is located in Malott Hall on the Lawrence Campus in Lawrence, Kansas. 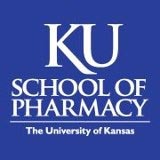 The Office of the Dean of the University of Kansas School of Pharmacy is located in 2056 Malott Hall, 1251 Wescoe Hall Drive, Lawrence, Kansas 66045; PHONE: (785) 864-3591; FAX: (785) 864-5265; EMAIL: pharmacy@ku.edu.